On Tuesday 18th May 2010, Dr Stefan Halper, Senior Fellow in the Department of Politics and International Studies at Cambridge University and Nigel Inkster, Director of Transnational Threats and Political Risk at the International Institute of Strategic Studies, took part in a discussion prompted by the themes of Dr Halper’s new book, ‘The Beijing Consensus: How China’s Authoritarian Model Will Dominate The Twenty-First Century’. In his book, Dr Halper argues that China’s challenge to the West stems from its ‘transformative brand of capitalism’ and an entirely different conception of the international community. He suggests that rather than promoting democracy through economic aid to the developing world, instead, through the policy of no-strings attached gifts and loans, China is building a new Beijing Consensus that will replace the so-called Washington Consensus. 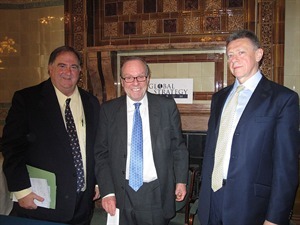 During the debate, Dr Halper was not altogether pessimistic that this alternative, authoritarian model would prove more popular to the developing world and that power would necessarily be diffused away from the West, but he believed it to be a warning to western policy-makers: ‘China promotes a form of authoritarian capitalism that discreetly confronts the post-war US-led liberal order and erodes western principles of governance….its success will diminish the principles on which our global standing rests’. He concluded that how the West addressed this challenge would answer the question of the extent to which we were content with this state of affairs.